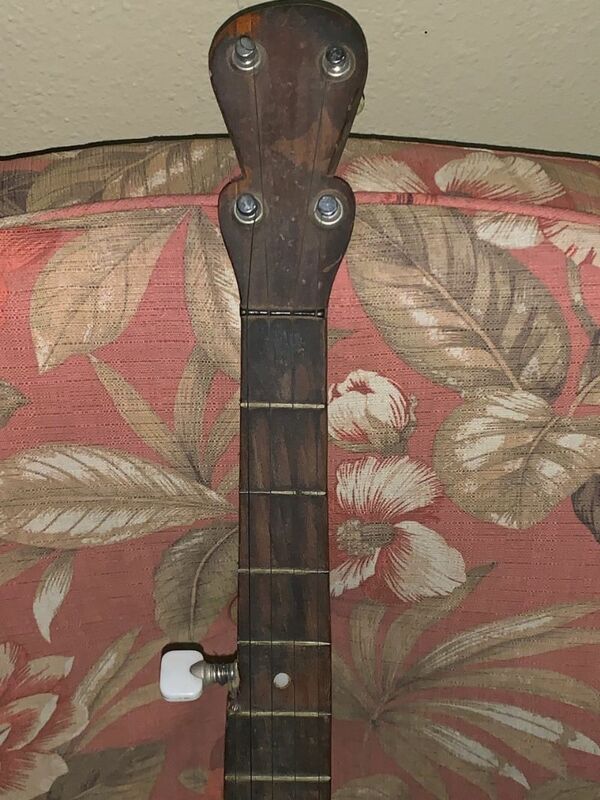 This banjo is owned by a friend of mine. 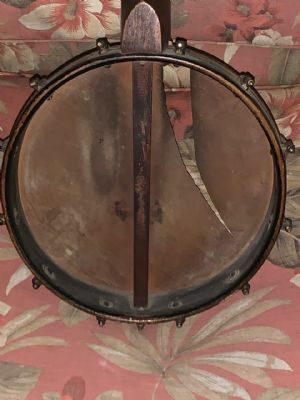 It was purchased by his grandmother, who was born in 1911. It has been in the family ever since. 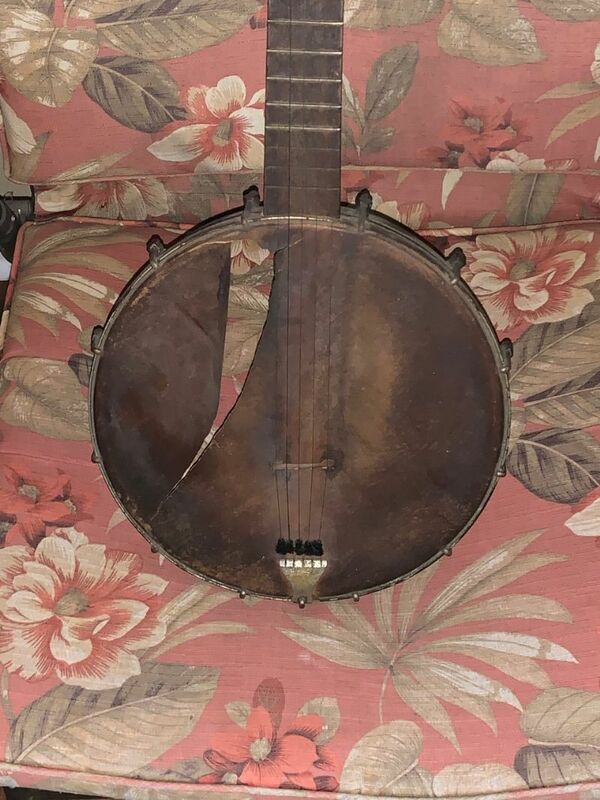 I've held this instrument, and I can tell you it is quite old and beautiful. 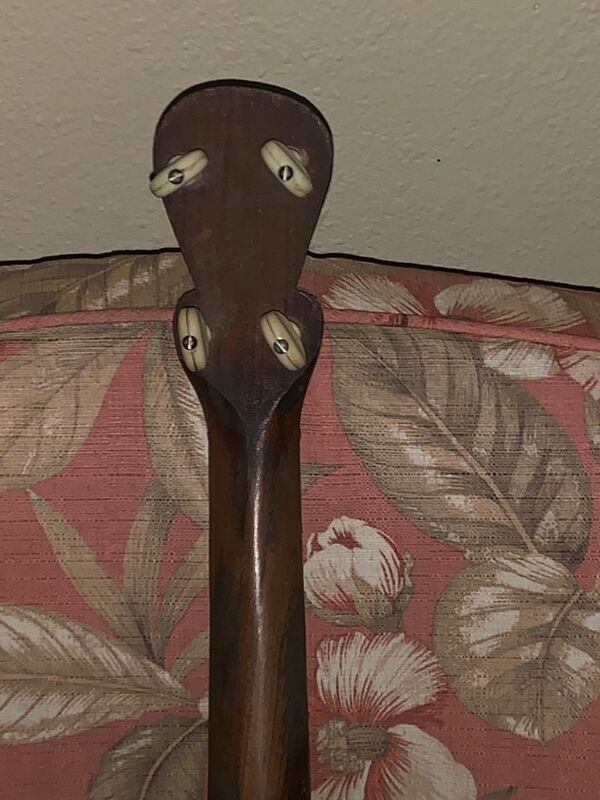 Its peghead reminds me of many turn-of-the-century models, but there are absolutely zero markings on it. 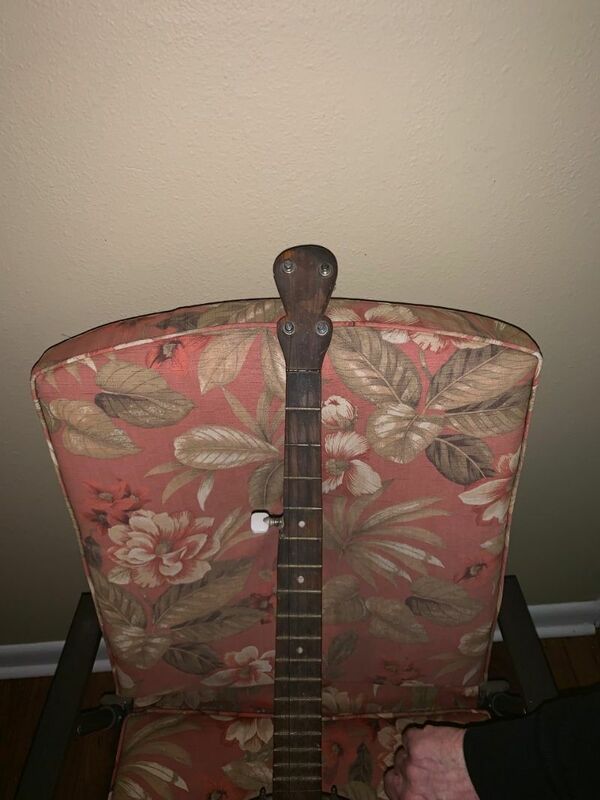 My friend has no intention of selling, but he's thinking about replacing the head and perhaps the bridge (doesn't seem to "fit" the instrument. Any help you could provide would be greatly appreciated. It's really a beauty. 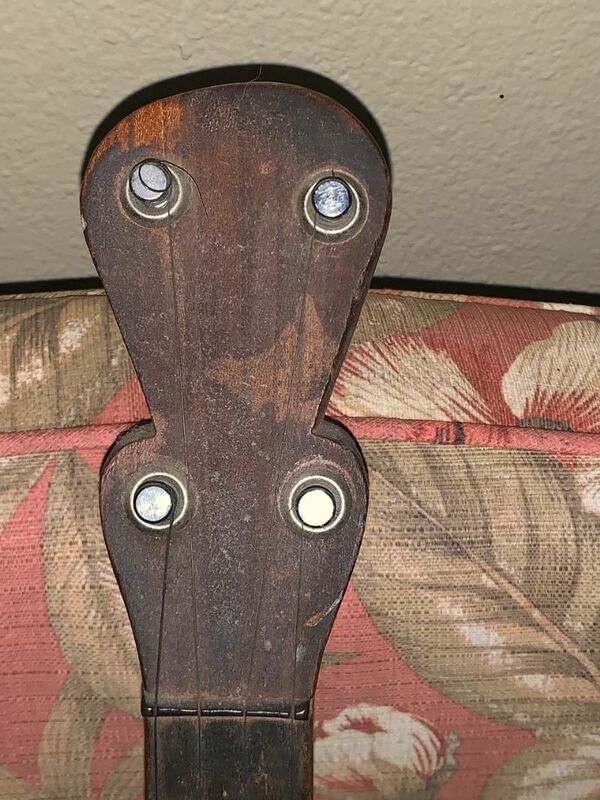 Looks like a Buckbee. Could be late 1800's or very early 1900's. Can you post a photo of the side view of the neck, where it meets the pot? 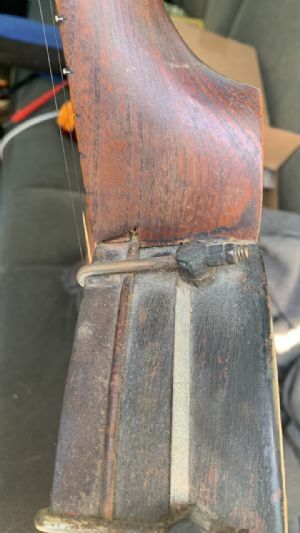 Oh ya....late 19th century Buckbee! 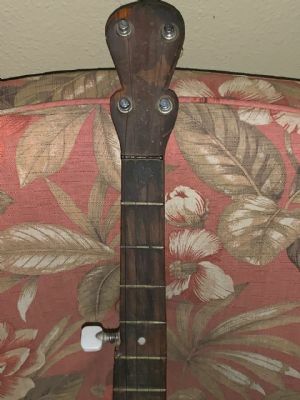 Man...that bridge is the "correct" style just for that banjo, a small 2 footed solid maple whip cracker! That could be the original bridge....I'd keep it on there. 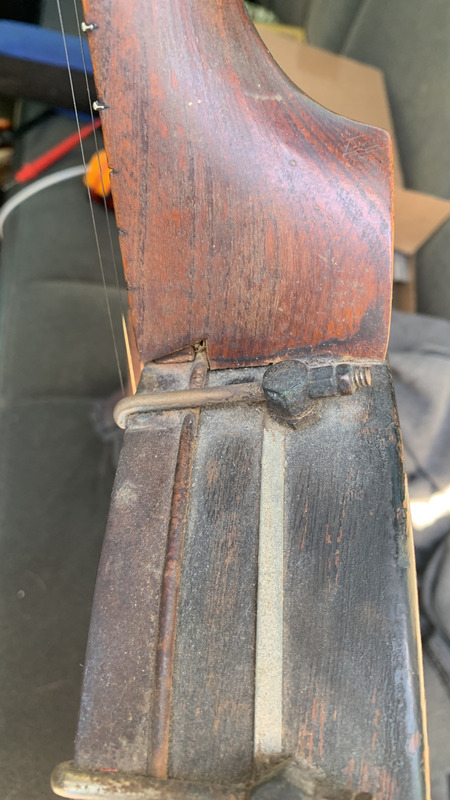 Only thing is, is that the steel strings more than likely have damaged it, and they're definitely not very good for that banjo's neck....that's a gut string banjo. 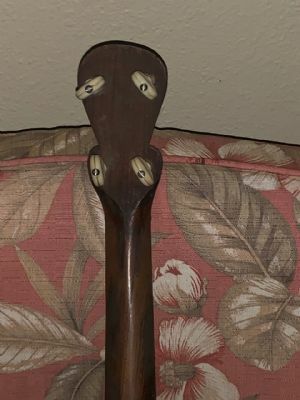 Put a new frosted top Remo head on it very tight, a set of thin nylon strings, that bridge or a similar one if damaged, and buddy...that little banjo will really bark! Set up right....they can be great banjos! Good luck with it...hope to hear you pick it for us sometime! The head needs to be replaced (Duuuh). 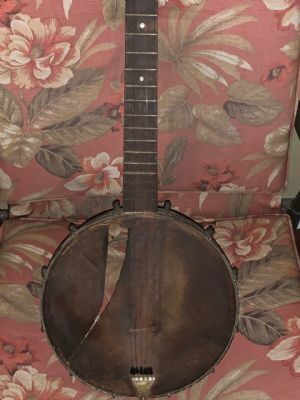 This banjo has a very dark patina and shows lots of love. Not sure how much time you want to put into it, but a skin head dyed dark would could match the rest of the banjo nicely. A new synthetic head might look rather out of place. Buckbee was out of business by the time hex shoes were being used. 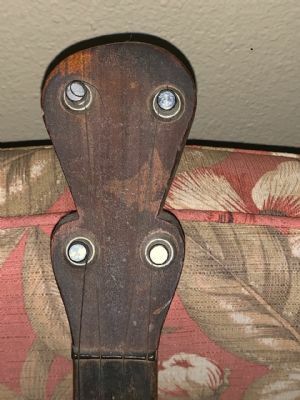 This is an Oscar Schmidt likely from the 1910's. Thank you very much, Bob. I couldn't have done it without you. They must have made millions of these things as they turn up everywhere.